How many crafty obsessions can one person possibly have? I found some cool beads at the store one day and it snowballed into a ton of new jewelry for sale in the store. My favorite item of all is the Cherry bomb bracelet (seen below). 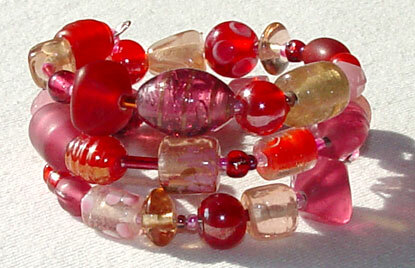 It reminds me of a bracelet I frequently used to borrow from my friend Leslie. Her taste in jewelry as well as her personal collection was always superior to mine, and in the store while buying supplies to make one single necklace, she appeared in the air above my shoulder like my conscience saying "You know, I would never buy a necklace without matching earrings." Custom orders have kept me fairly busy this week in the spinning department, but not to fear, there will be more yarn up soon. A while back, I tripped over some asparagus on the floor at Michael's. Did you know Michael's sold fake asparagus? They have other odd vegetables too, including artichokes. (Surveying the hilarious fake vegetable selection is actually what led to me noticing the grapes that now go on the Grapevine yarn.) When I'm bored, I like to think about what madcap, Seinfeldian situation could possibly arise in someone's life that would result in them needing to buy an artificial artichoke. I finally gave up on the blue ruffle scarf. I decided that after all the painstaking work I put into it, it simply wasn't worth the trouble. I think the yarn I used is cursed. So far it's been a sock and a half (my first socks ever, unraveled), a few gauge swatches (unraveled), the beginning of a small purse (unraveled) and a ruffle scarf (currently awaiting unraveling). In the event I ever want to make a ruffle scarf in the future, I have learned my lesson. I will cast on seven million stitches and decrease, rather than cast on a few stitches and increase. Here's an interesting fact about me: My taste in knitted garments is defective. Everything that everyone else loves, I hate. Everybody loves Noro yarns, and I think they're the ugliest things on earth and should be banned from use. Everyone loves the new purple sweater on the cover of Vogue Knitting and I can't STAND it! I hate big, cabled sweaters; in fact, I hate just about ALL sweaters. The only theory that I can come up with is that the fact that I have lived my life in a very hot, muggy climate combined with my wool allergy must scramble my brain fuses every time I see anything that could make me miserable in the 110 degree summertime heat. After much thought, I have decided that this is completely different from when I was in high school and refused to like anything that was too popular. Lately, I hate everything long before I find out everyone else likes it and I genuinely can't see the other side of the issue. It would be like if you woke up in a world where only polka music was played on the radio and you simply couldn't grasp why the rest of the world was happily listening to it. Years from now if you see me in a padded cell at the local mental facility muttering something that sounds like "ruffle edge ... tripped over some asparagus ... noro shawl ..." you won't be surprised. P.S. There are TONS of new things over in the store for you suckers wonderfully nice people to buy. New yarns, new coordinating yarn sets (one with matching earrings! ), and for the first time, scarves and stitch markers. It's a winter coat... for beer! I feel slightly less guilty this week after checking a few non-spinning related items off my to-do list. I finally sat down and spent 36 hours in a row finishing Harry Potter & the Half Blood Prince and even got some knitting done. The cat was very grateful that I was finally getting some reading done; he got a lot of lap time. I invented a new pattern and I haven't decided if I should post it here in the 'free patterns' section or try to submit it to a knitting magazine. It's a winter coat... for beer! Since I loathe big knitting projects, I made another pint-sized sweater pattern that fits perfectly over a beer bottle to use as a koozie. (or is it coozie? or koozy? I don't think I've ever had to spell that word before.) Or maybe I'll post the pattern here with a drawstring strap for use as a cell phone cozy and modify it for submission as a beer cover. Or maybe next time I'll finish this conversation in my head before starting to write my blog post and not bother you nice people with my self-contained arguments or tease you with patterns that I have not yet provided. But since I've already started with the pattern-teasing, I'll go ahead and continue by telling you that I have decided to post the pattern for my domo-kun fuzzy dice one of these days and also a few flowers I invented that I plan to use for my wedding bouquet. Who wants to bother finding fresh flowers in Vegas? Not me. I'm knitting mine. I have a knitted daffodil, gerbera daisy, and stargazer lily. I will close with a secretive note about how a recent ebay purchase may soon lead to a large quantity of not-very-expensive fancy scarves for sale over in the store. Cross your fingers!